Thursday, September 6, 2018, would have been a bloody day in Nigeria save the timely intervention of the Nigerian Police and other security agencies. 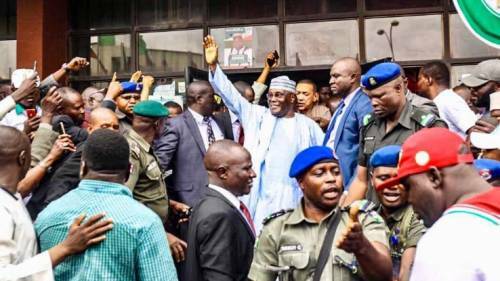 Former Vice President and PDP presidential aspirant, Alhaji Atiku Abubakar was at the party’s national secretariat with his supporters to submit his nomination form when some group of allegedly hired individuals reportedly showed up started chanting “Sai Buhari” leading to an altercation. Because this is a political season, reports like these are not new in Nigeria, however, this is a situation that cannot be swept under the carpet because some PDP presidential aspirants – Senator Rabiu Kwankwaso, Sule Lamido, and Ibrahim Dankwambo – have been harassed by some individuals positioned permanently at the Nnamdi Azikiwe Airport, Abuja to protest their presences or campaigns. The swiftness with which videos of these protests and riots are displayed on social media is highly suggestive that they are well planned. RELATED: With 10 potential candidates, who are the people who have a shot at overthrowing Buhari? It is important to state that political tolerance is a necessary ingredient for democratic growth, without which violence and will become the norm. It is evident that these individuals are focused on stoking the embers of the violence. At the moment, the polity is charged and these miscreants should be curtailed before they plunge the nation into chaos. President Buhari needs to put a stop to this immediately before it gets out of hand.